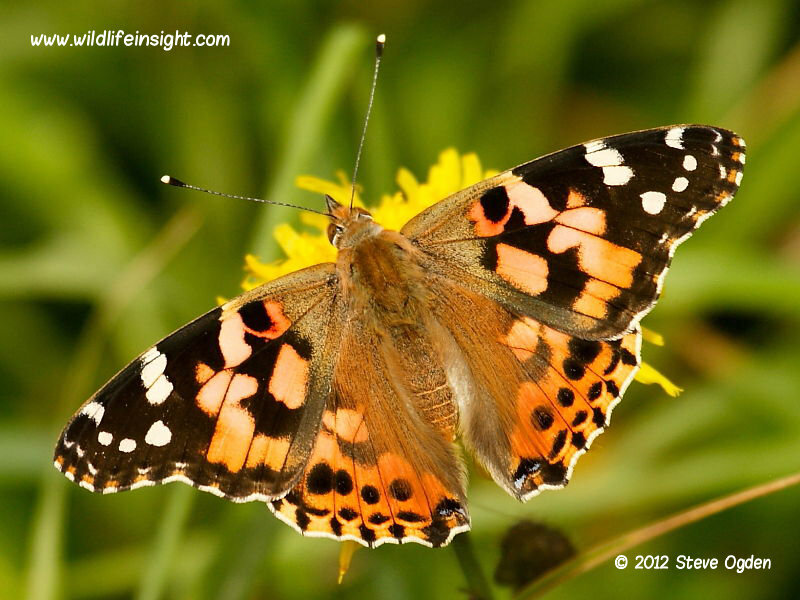 The Painted Lady Butterfly (Vanessa cardui) is a strong flyer and an annual migrant butterfly to the British Isles from Europe and North Africa. It’s also found in many US states along with the American Lady (Vanessa virginiensis). In the British Isles annual numbers vary wildly dependent on favourable weather and the success of breeding populations abroad. Periodic years of huge influxes occur as seen in 2009 when many millions arrived. The butterflies are found in a wide variety of open countryside and are frequently seen in urban gardens nectaring on flowers such as buddleia. 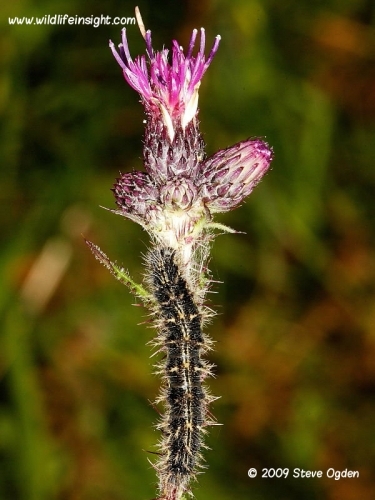 The caterpillars are also commercially reared and one of the most commonly reared butterfly species by children. The butterflies are commonest in southern regions but its range extends to the most northerly parts of the British Isles. In warm summers more than one brood may occur but the insects unable to survive the low winter temperatures at any stage of its life cycle. The Painted Lady Butterfly is easily identified by the white markings on the tips of the forewings and overall tawny-orange ground color. Both males and females have a wingspan of about 65mm and look alike. When freshly emerged some have a beautiful, pink tinge to the wings. From the underside the beautifully cryptic hind wings and the orange, black and white markings of the forewings make it recognisable even when at rest with wings are closed. 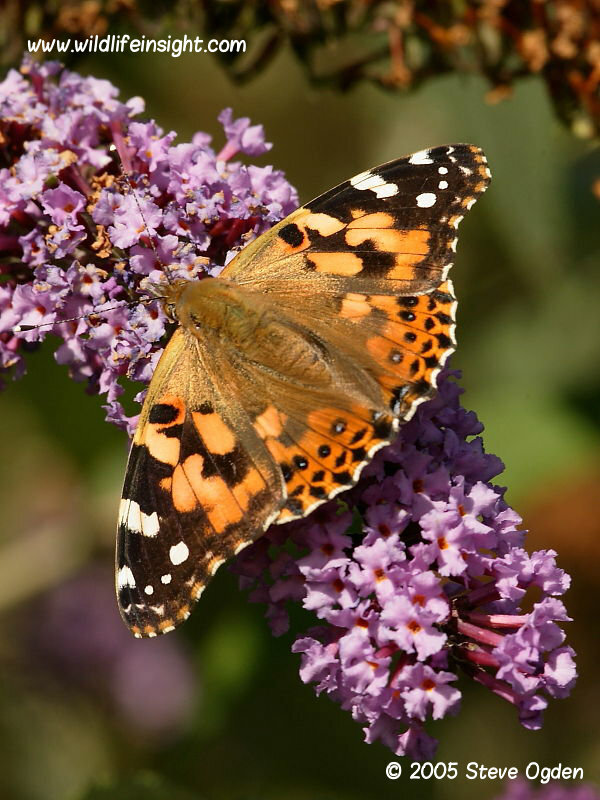 Other butterflies commonly seen feeding on Buddleia and Red Valerium in gardens are The Comma Butterfly, The Red Admiral Butterfly, The Small Tortoishell Butterfly, The Peacock Butterfly and The Large White butterfly. The first migrants arrive in early Spring depending on weather systems emanating from North Africa and southern Europe. The caterpillars food plant are mainly species of thistle (Carduus spp) but have also been recorded on other plants such as nettle, mallow, species of burdock and Viper’s-bugloss. 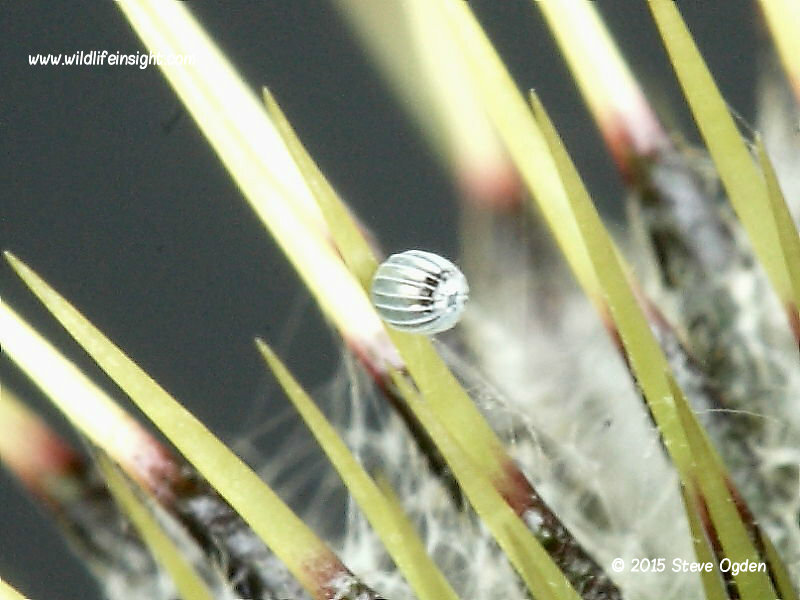 The females lay eggs singly, most frequently on the upper side of the food plant leaf but occasionally on the heads of Thistles. The eggs hatching within 7-10 days. 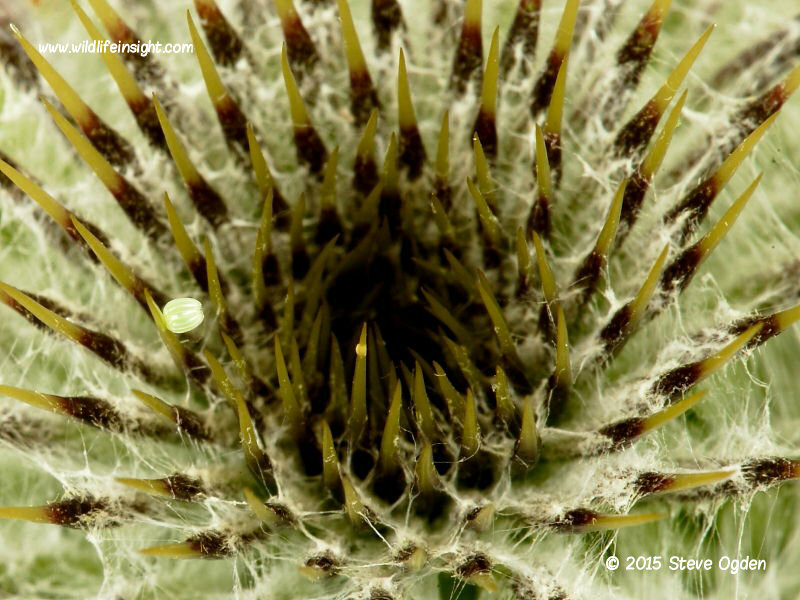 The Painted Lady eggs featured were laid on the thistle heads in a field alongside the Helford Estuary in Cornwall, UK. The female laid several eggs while being watched for over ten minutes and seemed to select the heads to lay her eggs in preference to the leaves. Whether this was done to give them more protection is uncertain. 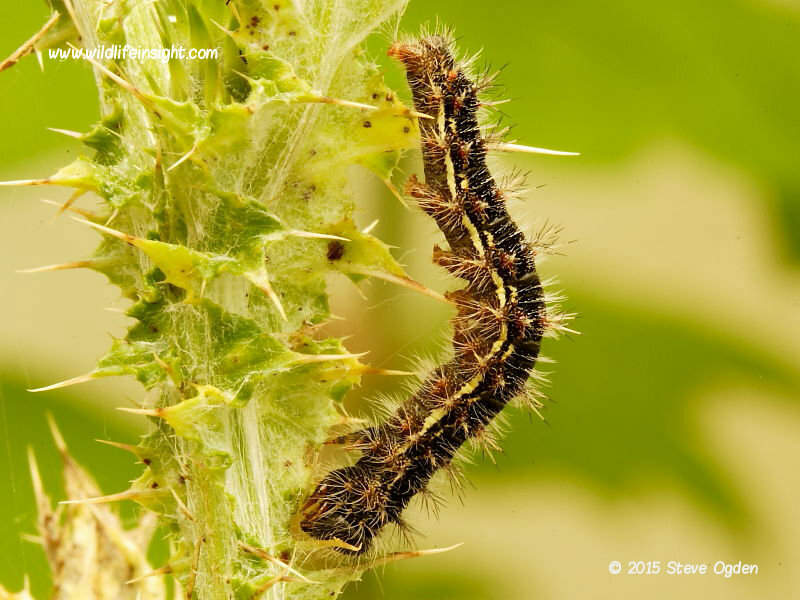 When small the caterpillars live for most of the time within a tent of leaves loosely spun together with silk. 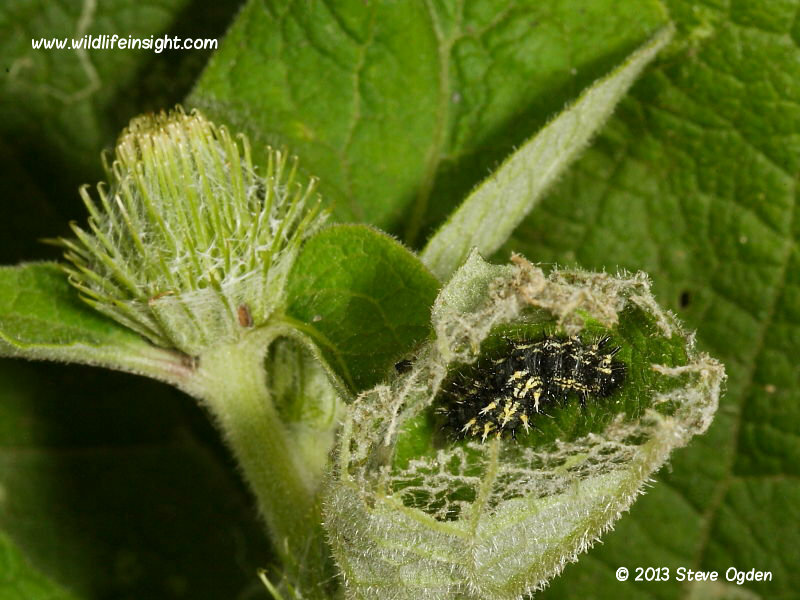 Speckles of black frass amongst the silk woven leaves is often a sign a caterpillar is present. 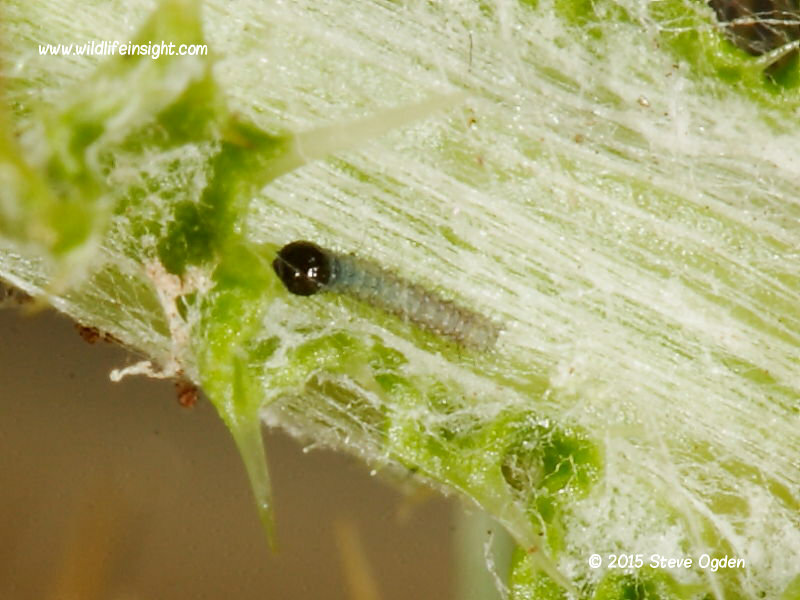 Only when larger are the larvae more likely to be found feeding outside a leaf tent on the food plant. 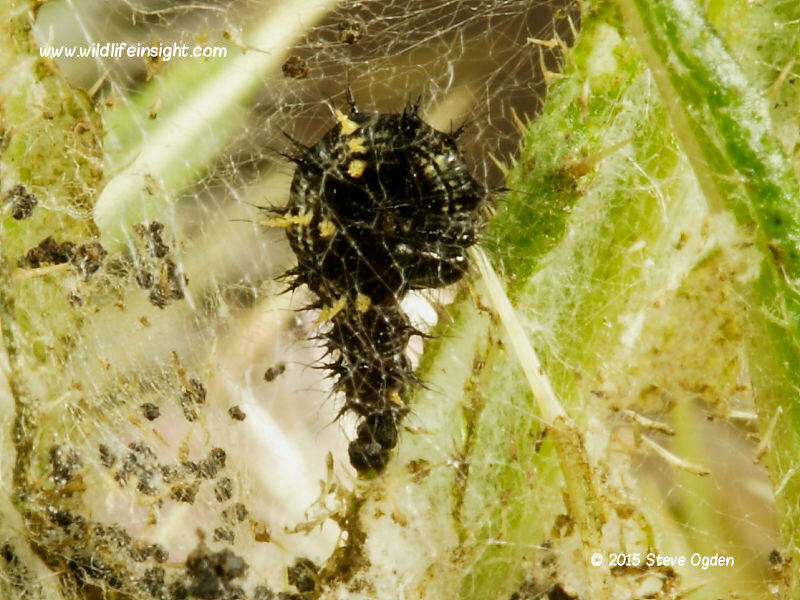 When fully grown, after about 28 days, they pupate by securing their cremasters to a silken pad inside a tent of leaves on the food plant. 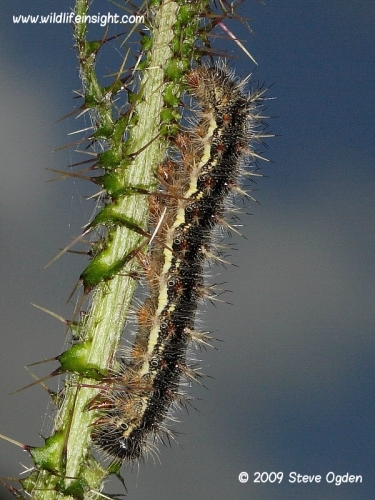 Emergent times of butterflies depends on temperature and may range between 14-28 days. 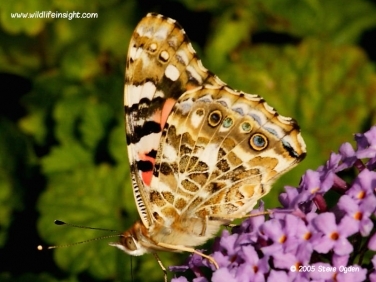 In September many butterflies attempt to migrate south to the continent. This southerly migration in years of abundance can be a spectacular sight with many hundreds of thousands being recorded on passage. 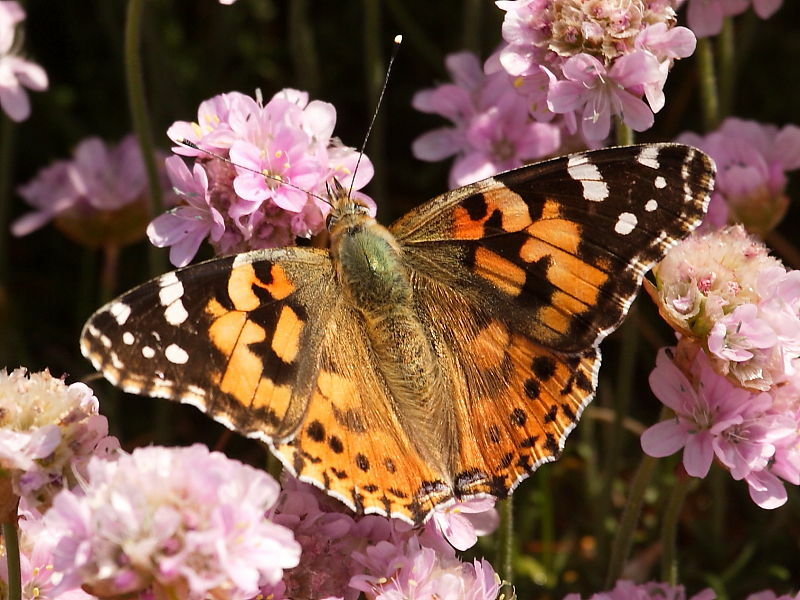 An example of this was witnessed on September 6th 2009 when butterflies passed southwards through a coastal, Cornish garden at a rate one every 5-6 seconds for most of a day.